Members of the SIUC chapter are students from the Department of Geography and Environmental Resources undergraduate and graduate programs as well as from the Environmental Resources and Policy PhD program. To create and administer funds for furthering graduate study and/or research in the field of Geography.To encourage members to apply geographic knowledge and skills in service to humankind. completed at least 3 semesters of college course work. $40 one-time payment to the International Chapter due just prior to initiation. 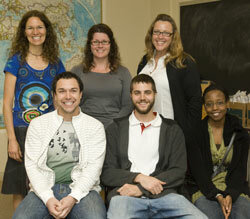 The Geographical Bulletin is a scholarly peer-reviewed journal published twice a year by GTU. Articles concerning any area of geographical interest are solicited from students and faculty. Initiates receive two free issues after initiation and may subsequently renew their subscription. Five scholarships are awarded annually to Gamma Theta Upsilon members: four to undergraduates and one to a continuing graduate student.